От September 25, 2014 Director of Project Finance Department of the Russian Investment Agency Kirill Amelkovich attended the International Economic Forum “Maslovsky Club of Investors”. 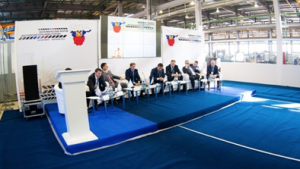 The event took place in Voronezh, in the largest in the region industrial park “Maslovsky”. The forum focused its attention on the discussion of such issues as practical implementation of investment projects, the prospects for the creation of industrial parks and zones of advanced development, the improvement of the competitiveness of the regional economies of the Russian Federation, the strengthening of inter-regional and foreign economic cooperation. At the main plenary meeting there were presentations of the investment policy of the Voronezh region and the success story of “Siemens-Transformers, the participants discussed the problems of PPP projects as well as some other topics. During the forum, through regular training seminars of the Association of Regional Investment Agencies created by the Russian Investment Agency, there was a master class “Role of regional development institutions in attracting investment and developing the subjects of the Russian Federation”, which was attended by representatives of development institutions of Vladimir, Kursk, Orel, Lipetsk and Belgorod regions. During the master class the representatives of the Agency for Investments and Strategic Projects of the Voronezh region reported on their activities and key areas to search for investors. The moderators of the discussion held by the end of the presentation were Kirill Amelkovich (the Russian Investment Agency) and Danil Kustov (the Agency for Investment and Strategic Projects of the Voronezh region). The participants of the discussion noted the importance of such events organized by the Association of Regional Investment Agencies.